Can we all agree that Legend has the worst opening in the history of franchise? Someone clearly didn't play this back in 2006. I did used to think that the AOD render being ran over by the bike was nothing, but these days I do find myself wondering if there really isn't a bit of symbolism behind it, especially given the mess that was the race of TRA x TRAE behind the scenes. It might be nothing but it does seem odd when you factor in the dispute for the franchise doesn't it? Kinda reminds me of the "I hate tombs" line from 2013. I always thought it was a joke, but people here have a different view I guess?? It was a joke, people are just really good at misinterpreting pretty obvious signs lol Though I really don't know how people actually thought she hated tombs, she immediately gasps in excitement because she's in a tomb not 10 seconds later. And the fact reboot Lara is definitely the one who is the most passionate about history and archaeology. For me it's super bad. 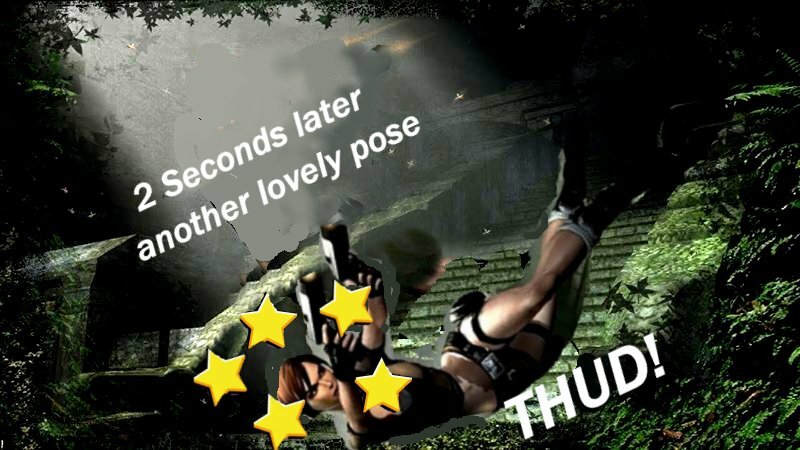 And let's not mention how they used TRAOD Lara there. I wouldn't be surprised people at that point would be just so fed up of her character/game that a terrible joke, with the subtlety of a sledgehammer to the face, was just something to add to the pile. Back on topic, honestly I don't mind it, and I swear I never noticed the AoD render, I was always rather hypnotised by all the stuff going on, plus the music was pretty neat. I liked that cringeworthy opening. It's just that after TR1-6 intro FMVs it felt really lacking in substance and totally useless. I guess it is very "gratuitous shots of Lara doing cool ****", for no reason. This is rather than how pretty much every cutscene in the classics (few as they were) had relevance to the plot, even the ones that showed events long before Lara was born. Last edited by Yeauxleaux; 16-04-19 at 19:10. That's probably why they included it. It looked cool and they didn't put much thought to it.